Hi, I’m Melissa from Melissa’s Cuisine. I’m excited to be posting here on Juggling Act Mama today! 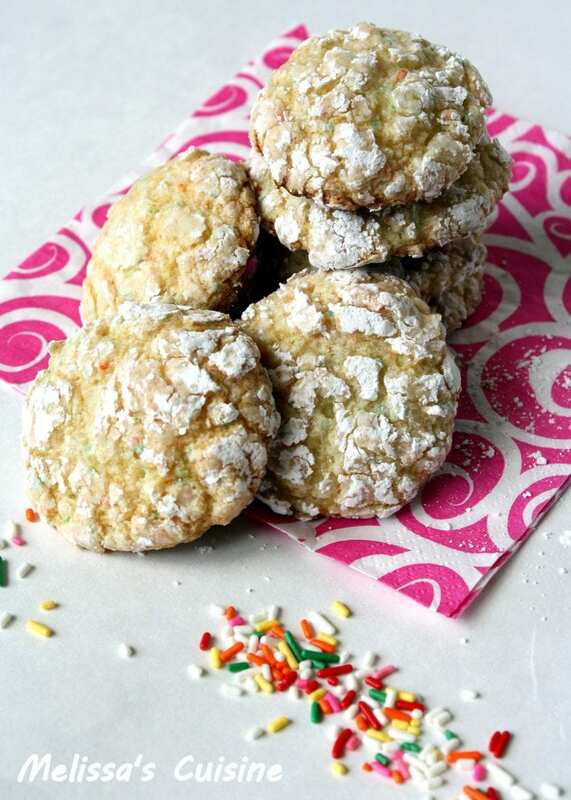 These colorful and fun Funfetti Crinkle Cookies are a fun twist on funfetti cake. Did I mention they’re easy to make? 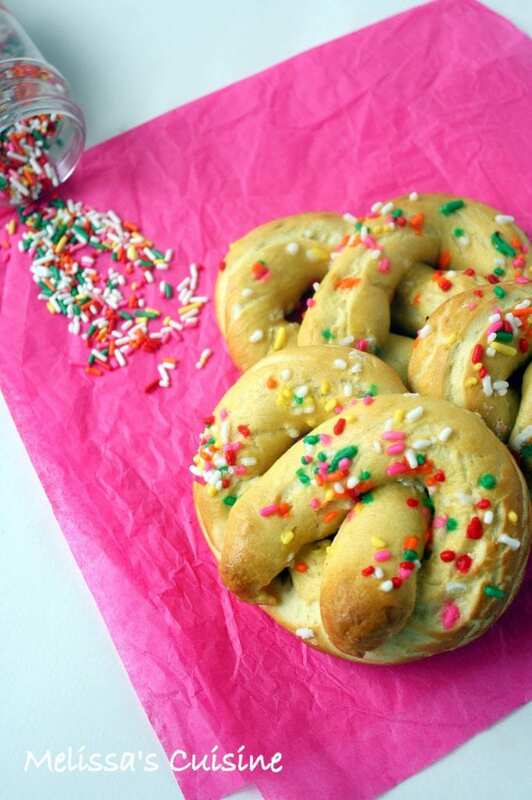 Change out your sprinkles for a festive addition to your holiday party! My favorite kind of cake is funfetti. I love the burst of color from the sprinkles and it’s such a fun surprise when you cut a slice of funfetti cake. For as long as I can remember I’ve always had a funfetti cake for my birthday! 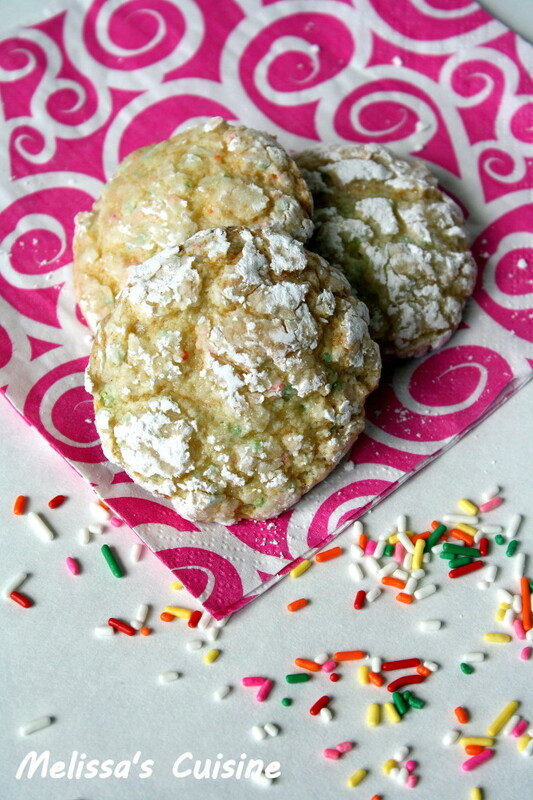 These Funfetti Crinkle Cookies are a fun twist on my favorite easy cookie recipe. 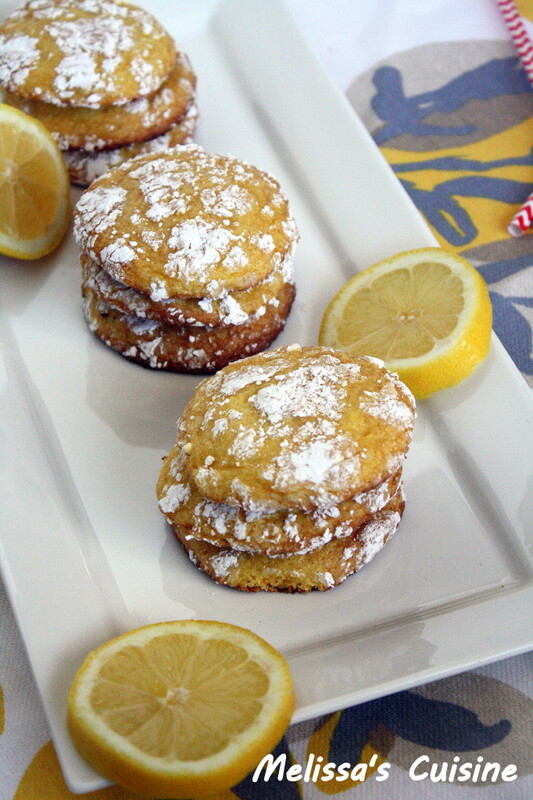 I’ve made Lemon Crinkle Cookies before, and they were a huge hit with Mike. Since then, I’ve been dreaming up other flavors, but I knew I would have to try Funfetti first. I made these for a cookout this weekend. My friends loved them and when they asked for the recipe, they were surprised when I could rattle it off in 15 seconds. 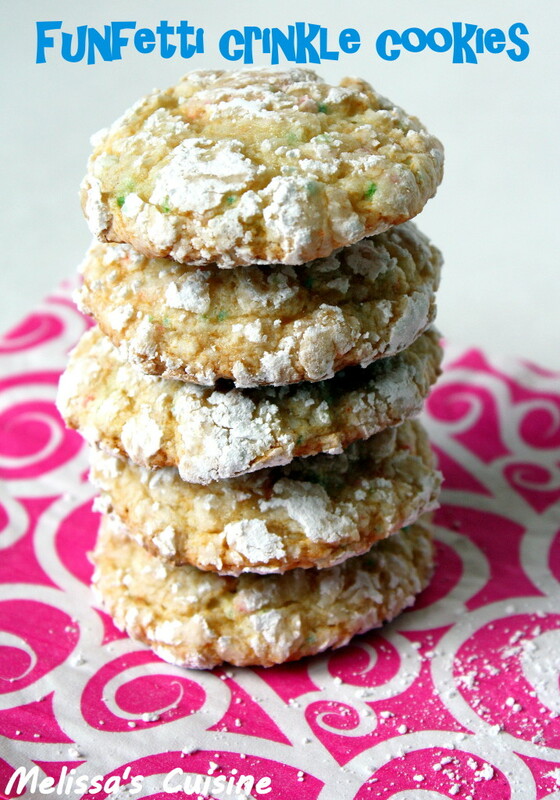 That’s easy to do when there are only 4 ingredients in these cookies! Yes, you heard right! These incredible cookies are made with just 4 ingredients. Here’s what you’ll need: a boxed Funfetti cake mix, an egg, a tub of Cool Whip, and powdered sugar. In fact, many of you might have everything you need to make these cookies in your house right now, so what are you waiting for? 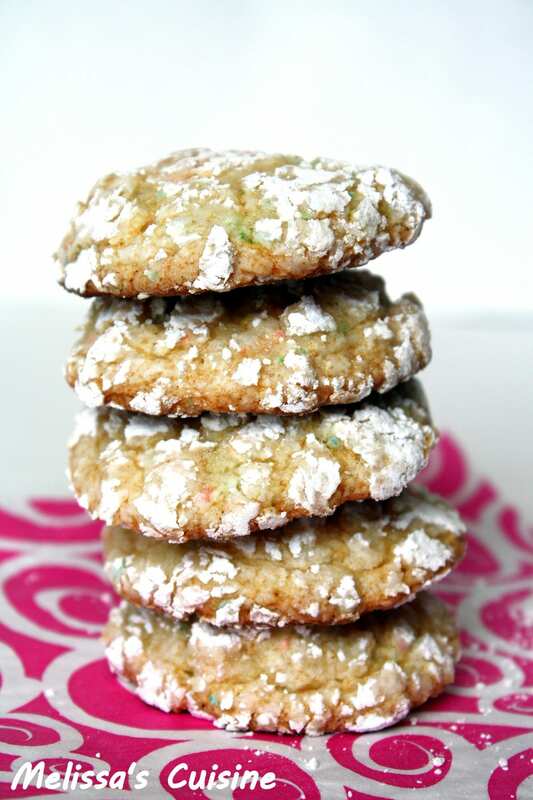 A delicious cake mix cookie with only 4 ingredients! 1. Combine the cake mix, egg, and Cool Whip to form cookie dough. 2. Cover and place in the fridge for 30 minutes. 3. Scoop dough by the Tablespoon and roll into balls. Then roll in powdered sugar. 4. Place on greased cookie sheets. 5. Bake at 350 for 10-12 minutes, until the bottoms are golden brown. Hi! 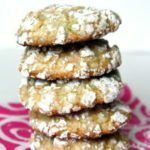 I’ve made these cookies so many times and have always gotten GREAT reviews. They’re my boyfriends favorite. Do you think I could make with red velvet cookies and get similar results? Hi Kelsey! I’ve never tried it but would love to know how they come out if you decide to test it out!